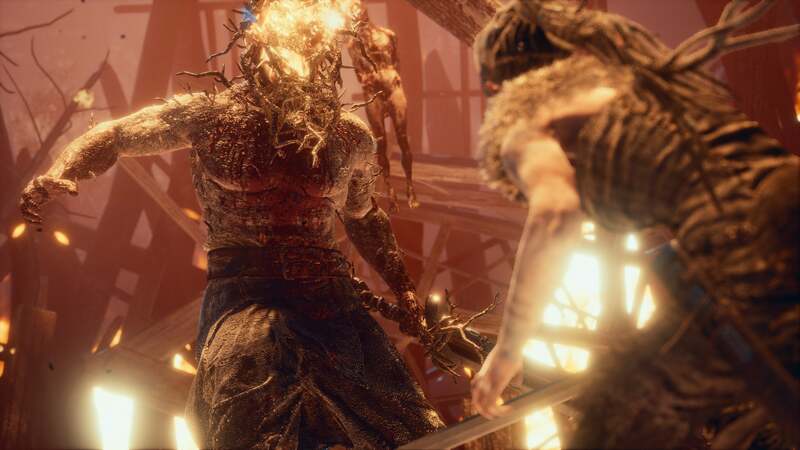 Hellblade: Senua's Sacrifice isn't a very long game, but it sticks with you when it's over. With a storyline that covers some dark themes and its unrelenting depictions of psychosis, it certainly took me some time to sort through everything that went down. So let's talk about the ending. Against my better judgement I binged this entire game in a weekend, starting on Saturday night and ending on Sunday. By the time I got to the final battle it was just getting dark on Sunday night, and after a few frustratingly difficult battles I was feeling just as exhausted as Senua looks in game. For this kind of game, it really added to the experience. I went into Hellblade expecting another fast, fun action romp from the folks at Ninja Theory, who previously made Enslaved and DmC. Devil May Cry. After playing for about 20 minutes, I had to put the controller down. I was so stressed out that I couldn't take it any more. The final battle was surprisingly cathartic, which was much needed at this point in the game. The thrumming, bittersweet yet epic soundtrack combined with wave after wave of enemies to mow down felt like the perfect culmination of Senua's journey. With Gramr now permanently charged up you could fight with the reckless abandon of someone who no longer has anything to lose, a warrior filled with divine purpose. But there's no heroic ending to this warrior's tale — only inevitable defeat, no matter how hard you fight against it. When Senua finally gives in to the rot that's been eating at her, Hela remains as impassive as she has been the entire game, an otherworldly figure unmoved by human passion or grief — or perhaps just a manifestation of the darkness in Senua's mind. Hellblade keeps you strung along because you want to unravel a mystery — even if, in this case, the mystery is just trying to sort out what is real and what is a manifestation of Senua's psychosis. Even at the bitter end we're not told explicitly what has happened. The last cutscene is long and drawn out as Senua bargains with the silent goddess. Throughout the whole thing she is still questioning — are you a lie, are you a liar, are you just a part or me, or will I get Dillion back? Even though she has been on this long, arduous journey, the delusion that is part of her psychosis still haunts her — there's no 'cure' for it, only the slow, painful process of coming to terms with it. In the end, Senua appears to be killed by Hela and then reunited in a way with her lover. We then see the goddess picking up Dillion's head and dropping it off a cliff and into the void below. It's then revealed that this was Senua, not Hela. As in the earlier parts of the game, her horrific death was not literal but rather a part of her journey. In this instance it's indicative of Senua coming to terms with loss and with death — not her own, but Dillion's. Even though the game is framed as a journey to retrieve Dillion's soul, it ends with Senua's acceptance of the fact that such a thing was never possible, that her beloved was already beyond her grasp. Featuring a heavy dose of psychosis and a little bit of Bloodborne-style combat, Ninja Theory's latest adventure has been received rather nicely. The trauma of Dillion's death is one of the major themes that Senua must deal with, while the second is that of her own darkness — ever present within her but exacerbated by her earlier treatment at the hands of her father and the death of her mother. The voices actually disappear for the last cutscene of the game, to a point where it almost feels like Senua has 'defeated' this part of herself. Of course this would be problematic in a game all about mental illness — you can't just 'defeat' a mental illness in real life. As the end cutscene progresses, however, we learn that the voices are still there. At first it's just the main voice, the 'narrator' who tends to speak more reasonably. But the other voices are still there — and the darkness too. "The darkness is here," the chorus reminds Senua in increasingly worried tones. But this whole journey hasn't been for nothing. "Wait, it's... different," the tone changes slowly as Senua walks away from the edge. As she learns to accept death Senua also learns to accept her own darkness — and the fact that it'll always be with her. But this time it's different. If you didn't watch the 25 minute feature included in the game's main menu, it's definitely worth a watch — both for an interesting look into the game-making process and for more information on Senua's experiences and how they reflect real people's lived experiences of psychosis. There's also a secret ending to Hellblade, or rather an extra scene you can get. The extra scene features Druth and is unlocked at the final portal if you've found all the lorestones in the world. Druth reveals that he was lying to Senua throughout the story. He reveals that he tried to broker peace between his people and the northmen after they took him as a slave but instead, after being tortured, he led the northmen right to them. But there's another part to it — he also reveals that her own people were betrayed by one of their own. He describes 'a man in black' who sounds suspiciously like Senua's own druid father. "It is not the Gods who cause so much suffering," he concludes, "it is those close to us." So what do you think? Did you interpret the ending differently? What do you think about the game as a whole? Let us know in the comments!